The reports of Andy Reid’s demise are greatly exaggerated. We read the same things for weeks: there’s a schism in the Eagles front office, Joe Banner is gaining power over Andy Reid, Howie Roseman was a pawn in that game, Andy was the only one in the front office who didn’t want to trade McNabb. I’ve debunked that claim a couple times here, but today Andy took to the airwaves to beat back the rumor himself. There was absolutely no debate. And there was never a point where we weren’t on the same page here. This is what we all felt was right for the Philadelphia Eagles and what would work for Donovan… We work very well together. I’ve obviously got the ultimate respect for Joe and Howie… but, when you have three people who work well together… people are going to try to work the gray area on you and try to find out “who’s making the final decision,” and “this guy’s against that guy” and that’s not how this thing operates. Andy was remarkably hostile about the idea if you listen to his tone. And I think rightly so. He is the “decider” in the front office, and has been for a number of years. If Reid wanted to keep McNabb, that would have happened. He clearly didn’t. I do think it’s funny that in refuting the debate “schism” argument, Andy had to admit that everyone was on board with trading McNabb from the beginning — if I interpret his meaning correctly that there “was never a point” of debate. If the Eagles were truly so willing to go into next season with McNabb, then there would have been a change in the thinking at some point in the negotiations. I doubt it (as does Les), and Andy confirms. Trading Donovan was on the docket since the last snap in Dallas. The Redskins didn’t offer the best deal, but McNabb forced Andy’s hand. Yikes. Jason Cole has been the one giving the most detail for this theory, saying that Donovan threatened to retire, or worse — return for his last season. Donovan’s agent, Fletcher Smith, basically confirmed it: “when we sat down and reviewed all the opportunities, we believed Washington provided the best one.” McNabb was able to review the opportunities? Wow. Sounds like he had way more influence in this process than we ever knew, and was able to basically hand-pick his destination. 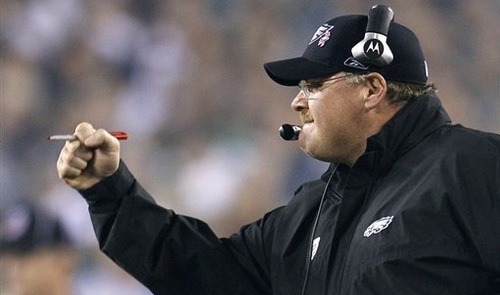 Tagged with Andy Reid, Front Office, Philadelphia Eagles, Donovan McNabb, Decision, Trade, Washington Redskins, Offers. April 6, 2010 by Brian Solomon.